Wow, summer sure has flown by. I can't believe that we are almost done with July.... grrrr.... I'm a little nervous for the summer to end. 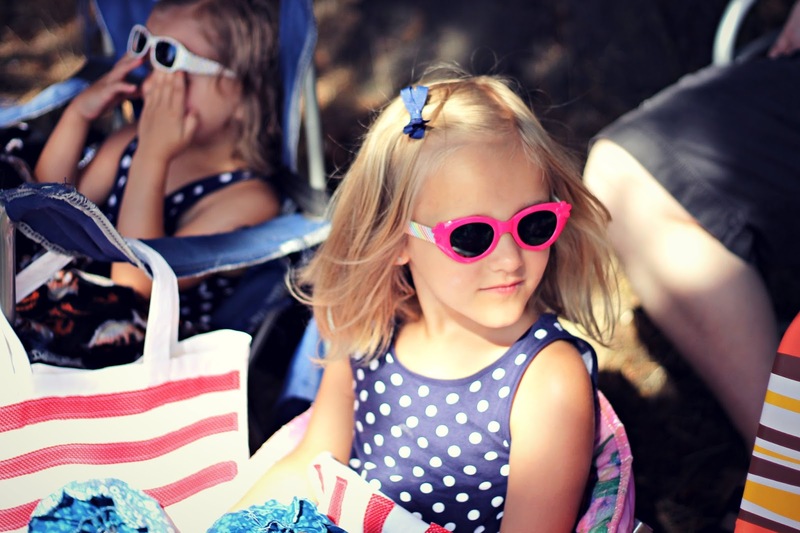 You see, my oldest daughter will be starting kindergarten and my middle daughter will be in preschool, which means I'm going to officially be a "School Mom", at least that's what I call it. You see, up until now, my life has revolved around whatever I have wanted it to. We wake up when we want, eat whenever, go wherever, and haven't had any limits set on our time. I realize this is going to change dramatically, so I've been soaking up these past few months before my life revolves around school. Know what I mean? We haven't really done anything super spectacular this summer. I started running at the high school track a few days a week with some friends, and we pretty much go swimming every day. No big vacations are planned, but we do have lots of visitors coming next month. Woot woot! 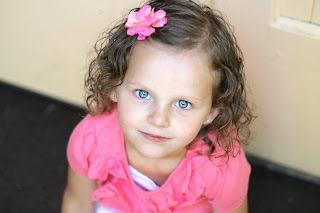 I took pictures of my kids. 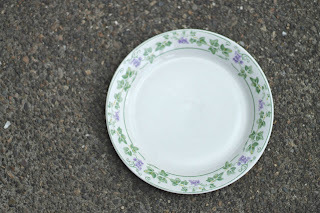 Last year I bought my first DSLR camera because I was sick of paying people to take pictures of my kids... so I've been practicing my mad photography skills, and here's one of my favorite pictures from this year. Ugh. Love that girl so much! And celebrated 8 months of having this little one (who's not so little... 22 lbs is a lot of squishy, cuddly chub!) in our lives. 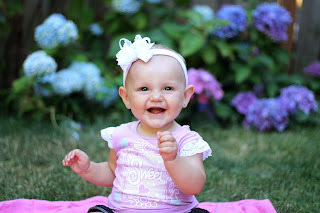 Aw, she just melts my heart every time, and I do mean ever single time, I look at her! And yes, I've even squeezed in some baking. Nom, nom, nom! I made these cupcakes for a baby shower a few weeks ago. I wasn't super impressed with how the actual cupcake turned out, but it didn't matter 'cause the frosting was simply dee-vine. Seriously. I can't describe how fluffy and light it was... you'll just have to make it for yourself and see what I'm talking about! I used the same recipe I used here, but modified it a little. I added more powdered sugar and cream since I was making a bigger batch. Also, I have a problem with not really measuring things, so I just kept adding stuff until I got the results I wanted. I know, this may drive some of you crazy, but I just can't help it! *In a bowl, mix together powdered sugar, peanut butter, butter, vanilla, and salt. Mix until creamy, scraping the sides of the bowl if needed. Add the heavy cream and mix on medium speed until light and smooth. 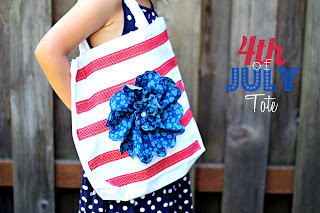 DIY 4th of July + $200 Gift Card Giveaway! I am sooooo excited to post today! Eeeee!!! I'm practically squealing like a little school girl! Why am I excited? Two reasons. 1.) I have a fabulous project tutorial to share with you and 2.) 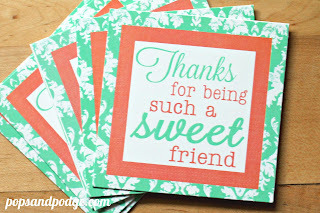 I have teamed up with some amazing bloggers as well as Coupons.com to give one lucky reader a $200 e-gift card to either Jo-Ann's or Home Depot. Keep reading for more info! But first, let's get started on this awesome project. 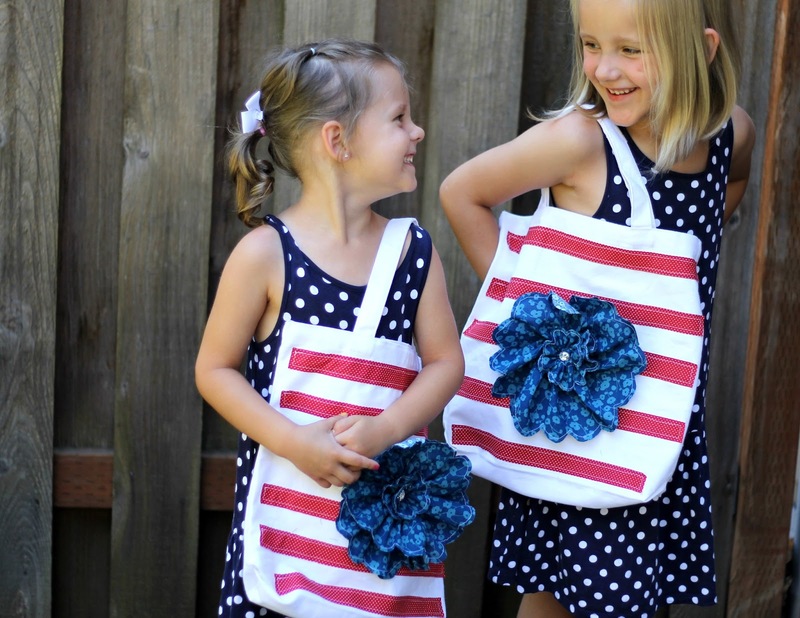 As you know, we love the 4th of July around here. Christie's husband is a Marine, and my brother is a Marine and I have another brother enlisting in the Navy, so we are pretty darn patriotic around here and have a deep love for this amazing country. To celebrate, we are always trying new recipes and creating new projects that channel those fabulous colors of red, white, and blue. Want to see more of what we've created? 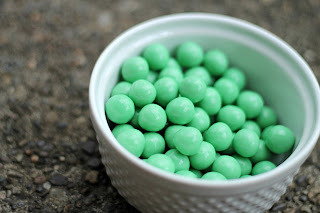 Just click here for some more simple treats you can make yourself! I am not much of a seamstress, so this tote had to be on the easy side. 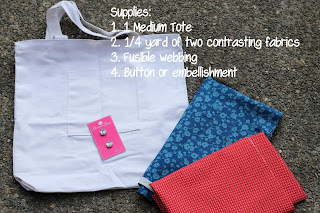 I waivered back and forth between being super adventurous and making my own tote, or make things simple and use a canvas tote... you can cllleeeaaarrrrlllyyy see that the canvas tote is the big winner here. 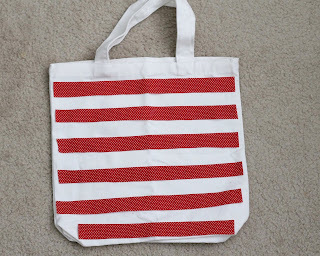 I wanted the tote to be red, white, and blue (of course) and I wanted some sort of flag theme. 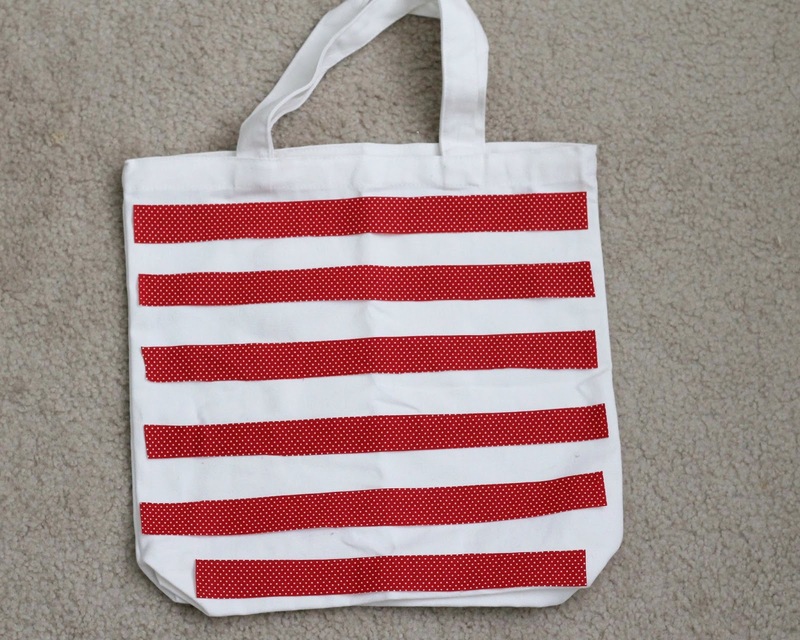 So, I decided to purchase just a plain white medium tote, some red polka dot fabric (which I am in love with!) and some blue fabric to adorn the tote with. For once, this project turned out just how I envisioned... I love it when that happens! Woot! Holla like a rock star! Step numero uno... Cut 5 or 6 red strips. One of my totes had 5 strips and the other one had 6 strips. That's just how it ended up.... I cut mine 1" wide and made them 13" long. 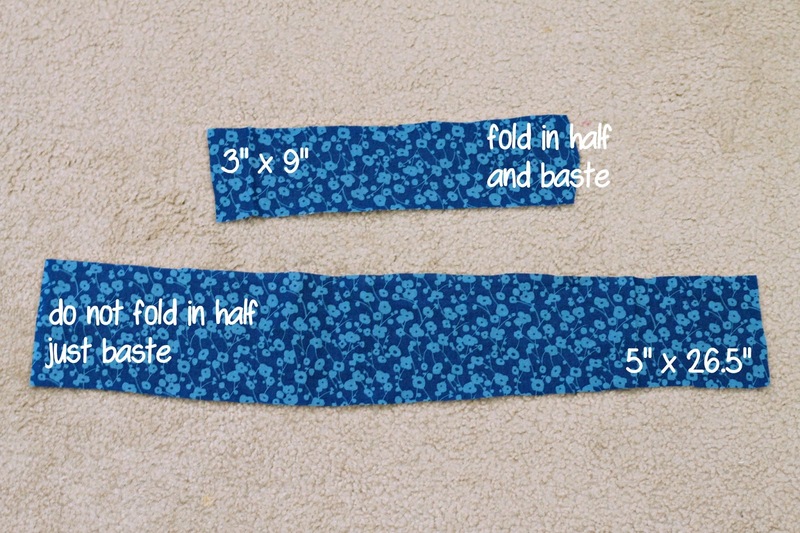 My tote was 13.5" wide, but I didn't want the strips to reach all the way to the end, hence the 13". 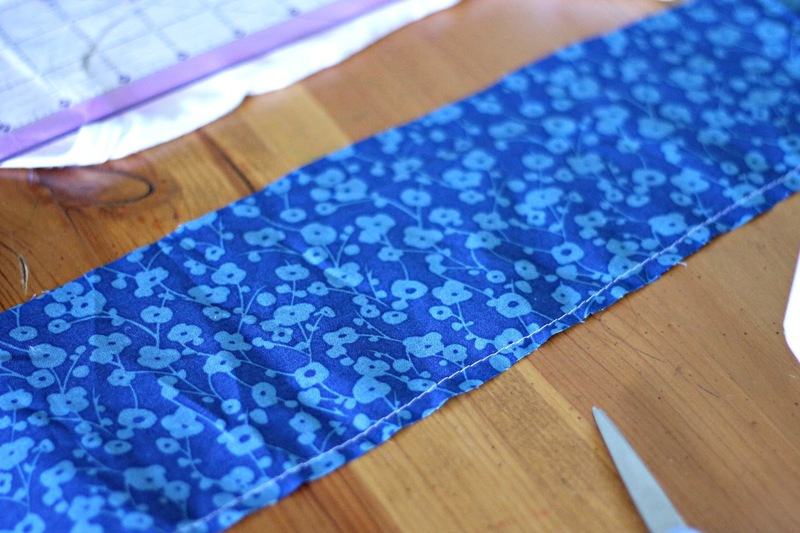 However, for the last strip, I cut it about 12" long because the bottom of the bag wasn't as wide. I then fused them onto the tote using some Stitch Witchery. That stuff seriously saved my life! I'm so glad I fused it to the tote... you'll see why in a second. 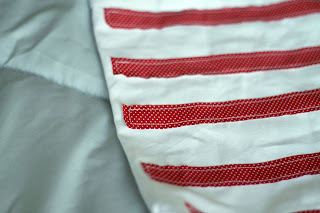 I didn't hem the strips because I knew I would be sewing them onto the tote later on, and after they were sewn, if they frayed a little, that's ok. That's the look I was going for. 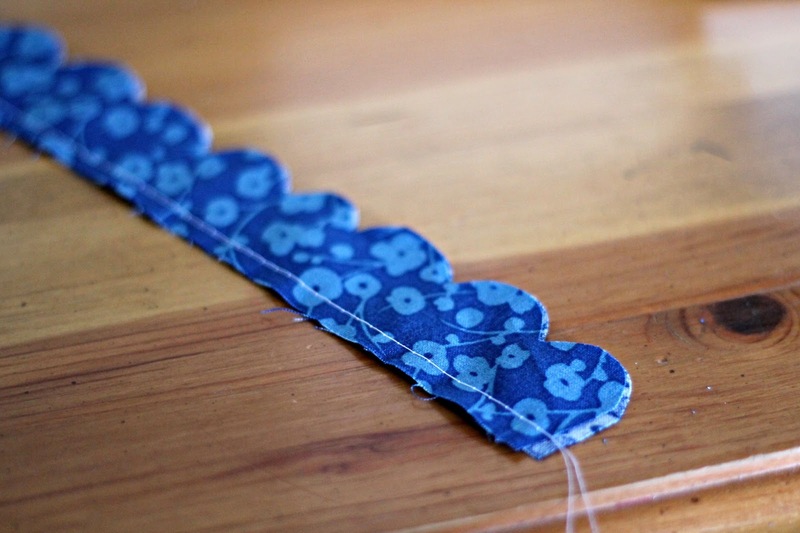 If your heart desires, you can hem the strips. Just cut a them a little wider. Here's what the tote should look like after the strips are fused onto the tote. 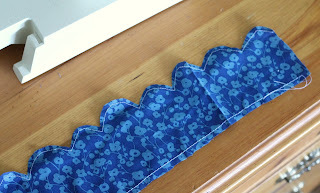 The smaller strip you will fold it in half and baste it. The larger strip I decided not to fold it in half (I wanted it to be kind of floppy) so I just basted it. 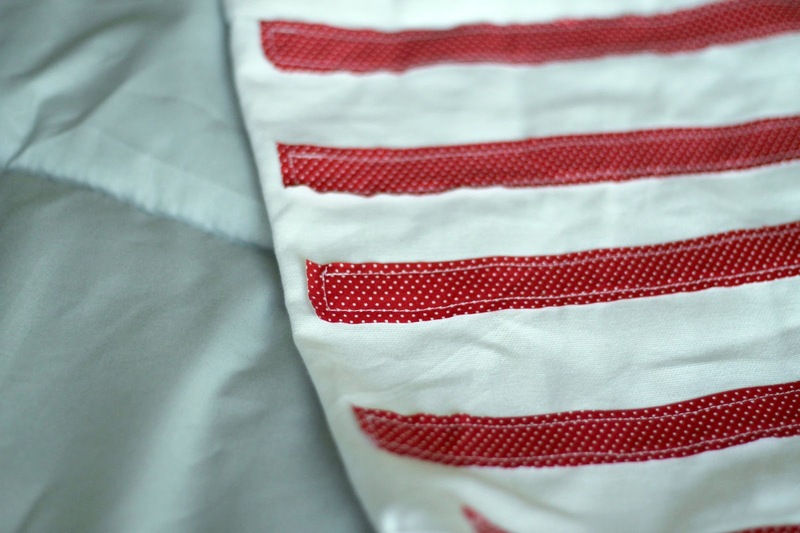 I didn't hem the strips either because I wanted them to be a little frayed, but I didn't want them to fray completely, so the stitching helps with that. See how lovely it looks all basted? 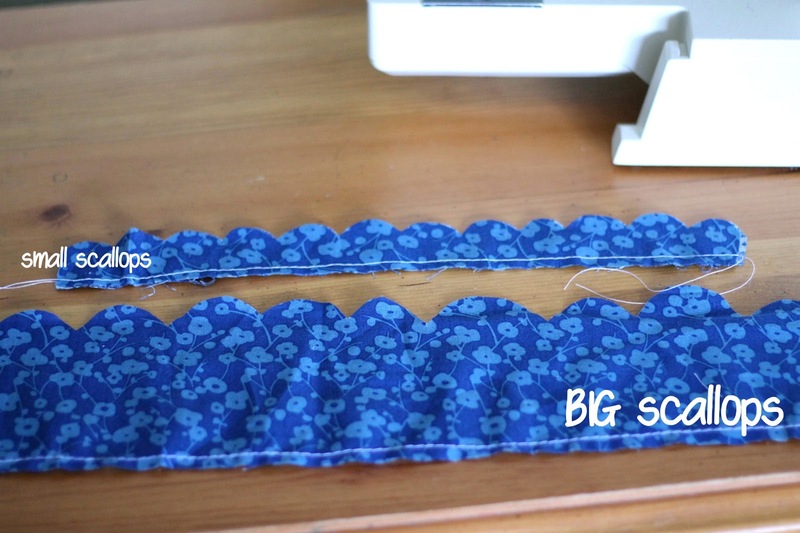 I cut smaller scallops for the smaller strip, and larger scallops for the larger strip. Step #4. 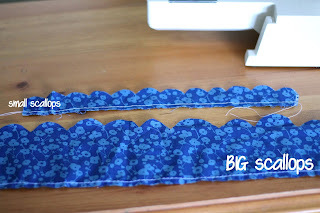 Sew around the scallops. Step #5. Gather both strips to create some ruffles. I'm not very good at gathering material and ruffling, so this was probably the hardest part of the whole project. Remember I'm a little awkward at this kind of stuff? Well, if you're a whiz, then this whole step should be a breeze for ya. Gather the strip until it makes a little circle. 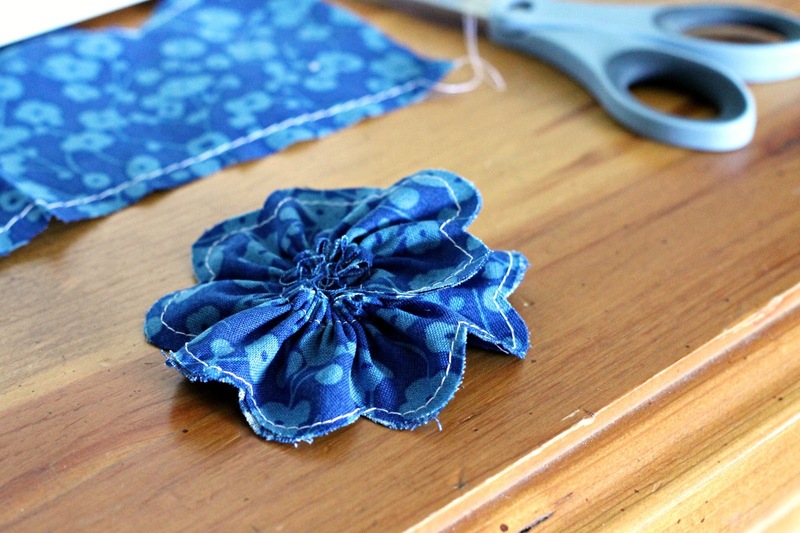 Make a little stitch by hand to fasten the circle together. My circle overlapped a little, and that's perfectly okay because it adds a little to the natural flower affect I was going for. Do this for both strips. Step #6. 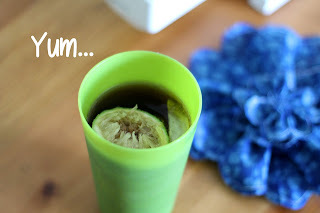 Take a little break and enjoy some smiles from a sweet baby girl and and Diet Coke with lime. Step #7. 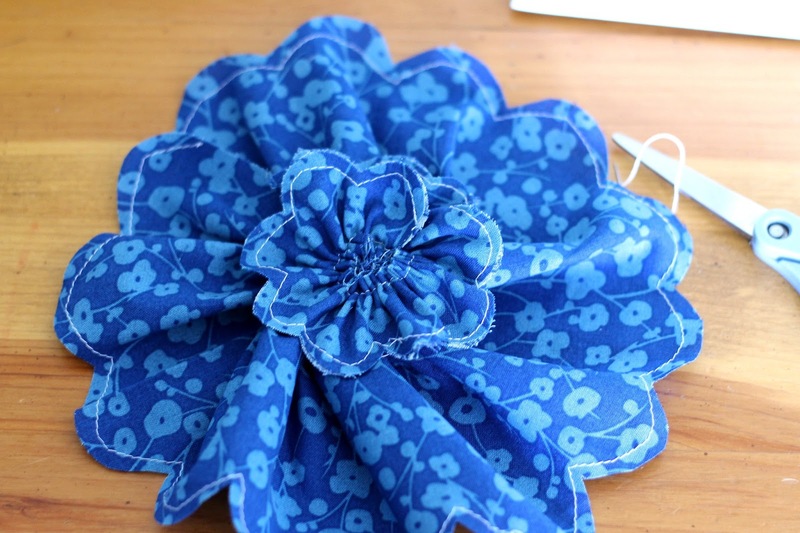 Place the smaller flower on top of the bigger one, and sew in place. I just did little stitches by hand at 12:00, 3:00, 6:00 and 9:00 positions to make sure it was on there securely. Step # 8. Sew the flower securely onto your tote and add a little embellishment! 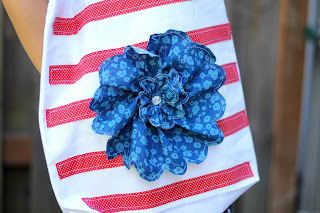 My girls picked their embellishment out, and of course it had to be a little sparkly button! *Little side note: My flower was a little floppy, so I just dabbed some fabric glue here and there to adhere the petals to the tote. If you don't have fabric glue, I'm sure a hot glue gun would work! I would love to see all pictures of your totes and learn more about you! 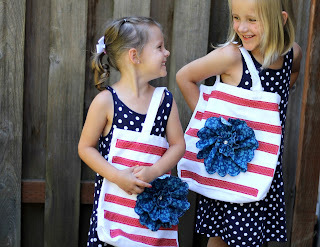 I may even do a post featuring your totes! See, isn't that a fun project? Yippee! Now, for some the other fun stuff! 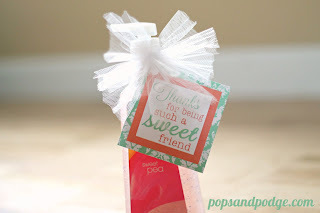 I have teamed up with Coupons.com and seven other bloggers to host this giveaway and blog hop! Stop by and show them some lovin'! They are fabulous bloggers, and I have admired their talents from afar. They have been so amazing to work with! Whoa, that's awesome sauce. Seriously. $200? You get to choose between two awesome stores? You've got to enter this giveaway! Snap to it! The giveaway runs from July 1st through midnight on July 7th. To enter the giveaway, simply tell us what DIY 4th of July project you would like to create, and "like" each of the blog hop hosts on Facebook. That's it! The winner will picked via Rafflecopter on the 8th and will be contacted via email. If you do not respond to the email within 48 hours, we will pick another winner. Now I'll stop gabbing and let you submit your entries!! Growing up, Sundays were a special day. We would go to church and come home and spend time as a family. Once a month, this meant getting together with my aunts and uncles and cousins and having a fantastic dinner with a delicious dessert, but the other 3 weeks out of the month it was just my parents, my 3 brothers, and me. My mom would always bake some sort dessert. She always made it from scratch, and usually without a recipe. Yep, my mom is gifted like that. She can just throw ingredients together, and it will come out to be a gourmet meal. No recipe needed. While enjoying our dessert, we would have great family discussions. 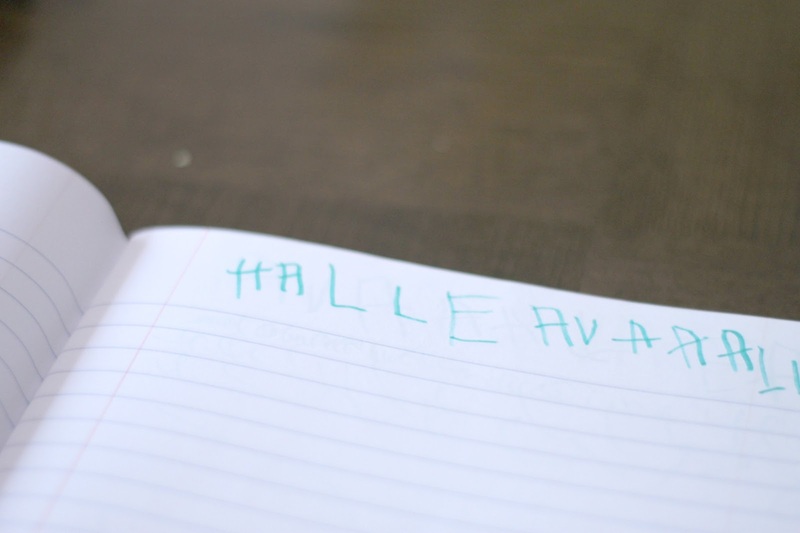 We would talk about what we learned about in church, talk about our week and what we did, and one time we even discussed what makes a swear word a swear word. Yes, we had some deep discussions! Often times, we would have neighborhood kids stop by for the treats and to chat with us. It was always a lot of fun, and they are some of my most precious memories. When I got married, my husband soon discovered our Sunday night treasures. Since he is the only in-law on my side (none of my brothers are married) she wanted to make sure he was spoiled rotten, and soon discovered what treats he liked. She would then make them to entice us over... and it worked like a charm. For the past 2 years, we have lived far away from both of our families, and have sorely missed Sunday night dinners and treats. Yes, we Skype with both of our families, but it's just not the same. So, we have started baking our own treats each Sunday. Without fail, around 6 p.m., my husband starts to scour the internet for a delicious treat that we can bake. He does most of the baking, and enlists the help of our 2 girls while the baby and I sit on the couch and rest. 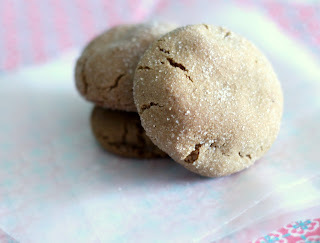 This past week, we decided to make some Peanut Butter Molasses cookies. 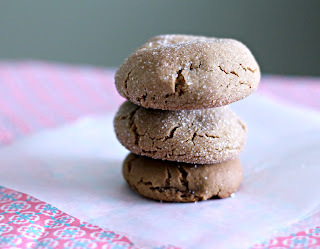 We both love peanut butter and molasses cookies, so when we found a recipe that called for both, we knew that it was meant to be our Sunday treat! We made a couple of batches, one rolled in sugar, and one not rolled in sugar... and I'll just save you some headache and tell you to ALWAYS go with extra sugar. It just completes your cookie! What I loved most about these cookies was how chewy they were. Mmmm how I love me a chewy cookie! Biting into one, I didn't know what to expect, but you can taste a hint of peanut butter mixed with the spice of molasses. It was like a match made in cookie heaven. Go ahead... make a batch and try them for yourself! *Preheat your oven to 375 degrees Fahrenheit. *In a large bowl, cream together the brown sugar, peanut butter, molasses, and egg. *In a medium bowl, mix together the flour, baking soda, ginger, cloves, and salt. Add this to the brown sugar/peanut butter mixture. * Shape some dough (about a tablespoonful) into a ball and roll it around in the sugar. Place on an ungreased cookie sheet. When the sheet is all full, put it in the oven and bake for about 9-10 minutes. *Transfer to a wire rack and let it cool down! So.... I have a confession.... actually, I'm sure I'll eventually end up confessing a lot of things on here, but let's start with, this one. I plan on gathering recipes from my husband's parents and siblings and making them and taking photos of them for the cook book. Photographing food is one of my favorite things to do, and I want to get better at it, so I figure this is a good place to start! I've been eyeing ramekins at Target for awhile. I walk by them every time I'm in the store (which is quite frequent) and I just look at them.... and trying to justify spending the $2.39 on them... yes, I'm that much of a tight wad. Finally, I took the plunge and bought a couple! I know, exciting, right? I know you're all super thrilled and are probably wondering what I've baked in them. So, as of right now, I use them to hold my mints. 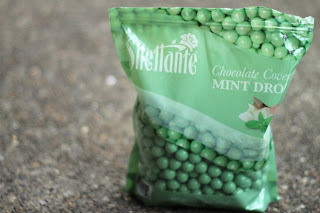 Ah yes, these glorious mints from Costco. 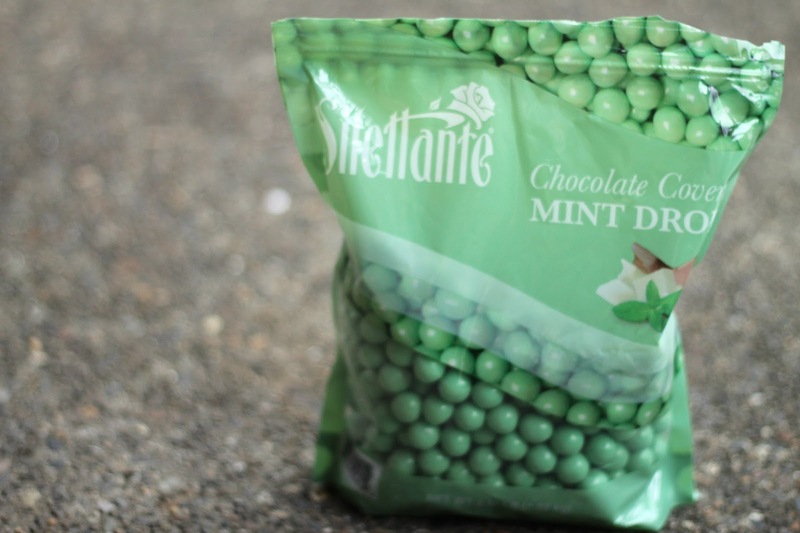 They are dee-lish. And not only are they delish, but I am in love with the color! I have them in a jar sitting on my entertainment center (yes, I still have one of those) for decoration. Do you have any ramekins? If so, what's your favorite thing to bake in them? It seems that dinnertime is a little stressful at my house.... or maybe my patience just runs out at 4:00 p.m. and anything that happens after that makes me stressed out. Is it just me? I sure hope not, cause then I would feel silly letting everything get to me. 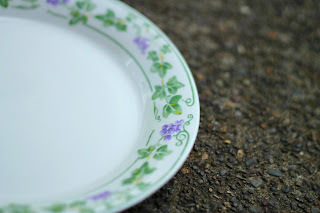 It never fails that as soon as I start making dinner, my kids are immediately at my feet telling me that they're hungry, and they start opening the fridge, and the pantry, and trying to get cups down for a drink.... all while I'm trying to open a package of chicken and dump it into the frying pan without a) trying to touch any of the raw meat (gag) and b) trying to make sure the empty package makes it to the garbage pan without contaminating anything.... yeah, it's quite the scene. And not always a pretty one. So, I came up with this idea of having a dinnertime journal. This little journal serves serves a few purposes. While I'm preparing dinner, it gives my girls something to do and therefore keep their mind occupy from their said hunger pains.... and it also helps them think about their day and remember what they've done. 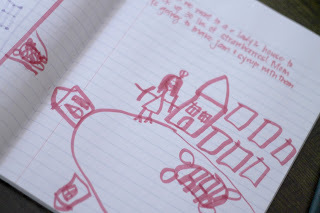 I am a firm believer in journal writing and I want to help my girls keep a little record of what they've done. For these little journals, I didn't do anything super fancy.... 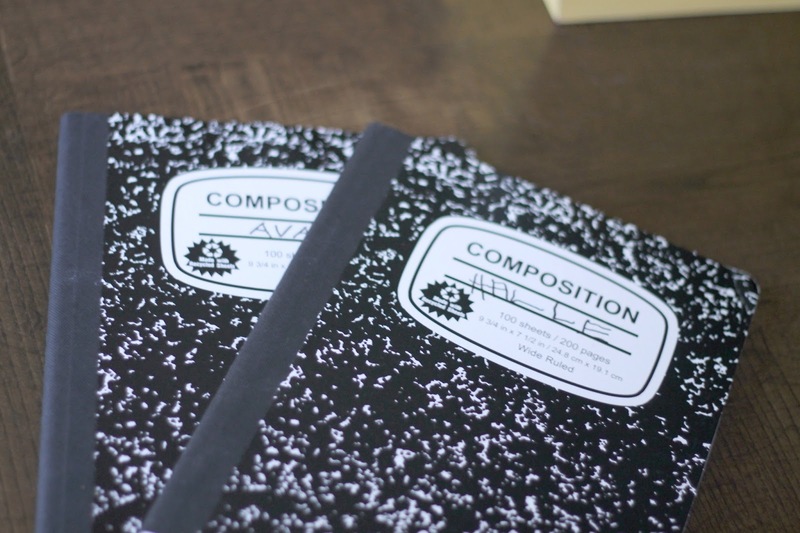 I simply went to Target and bought the cheapest notebooks I could find and slapped their names on the front. Then, while I'm trying to prepare a somewhat *cough cough* nutritious meal for my little brood, my girls draw pictures about their day. I love seeing what they come up with. They draw things that I would have never thought of. 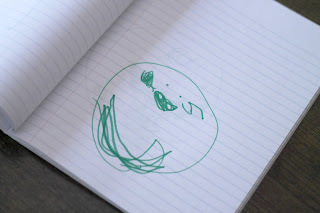 These are drawings from my almost 4 year old... She mostly writes her name and her sister's name, or draws random smiley faces, like the one below. I just love looking at all her drawings! They are so cute and funny! The other day, she drew me a random picture of a lemon and a bar. Not a lemonbar.... on one side of the paper was a lemon, and on the other side of the paper was a brown rectangle that she said was a bar. A bar of what? I don't know... just a bar! I love that picture! We had gone to pick up a bucket of strawberries from a ladies house, and I was impressed that Ava had remembered that it was at the end of a circle. She drew the lady standing outside, and she drew our van.... love it!! It is pretty funny because her pictures are of the places we go.... and it seems like every day we are at a different store... Wal-Mart, Winco, Target, Bi-Mart, Goodwill.... sheesh! We go to a lot of different stores! Ha! After dinner is fixed and we are all sitting down at the dinner table, we go over their journal entries. They each tell me what they drew and what they remember about their day, and I write a couple of sentences down for them. Ok, that makes me sound like a lazy and mean parent... which I try not to be... All I'm saying is that the end of the day is not my prime time for trying to have a spiritual moment with my girls. So, we have started reading our scriptures at dinnertime! After our meal is finished, instead of jetting off to do whatever we do, we sit and read 5 verses and talk a little bit about those verses. Right now, our scripture time lasts all but 4 1/2 minutes, and it usually consists of me telling Halle to be quiet and listen to daddy read about 28 times. Are my kids getting anything out of it? I don't know, but at least we are trying. 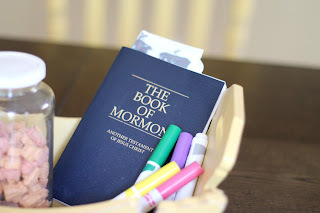 I have ended up keeping their markers and our scriptures in a little basket on our table so that we all remember to write in our journals and read our scriptures. What are some ways you keep your kids entertained while you're cooking dinner? Ahhh yes... They looked spectacular! I was so excited to taste them.... and then I picked them up. And they crumbled. Right in my hands. I was devastated! Why? What did I do wrong? These things tasted delicious.... but they fell apart right before my very eyes. I mean, the website I got the recipe from showed that her granola bars held their shape just fine, so why didn't mine? Hmmmm..... after racking my little brain trying to figure out how this could happen.... and the only thing I could think of was I didn't pack them tight enough. Want to attempt these granola bars? I think you should! I bet you can follow directions better than I can! Ha! *In a large bowl, combine the oats and the crispy rice cereal. *In a medium saucepan, melt together the honey, brown sugar, peanut butter, and butter. Over medium-high heat, bring to a boil then bring the temperature to low and simmer until the sugar disolves. Remove from the heat and stir in the vanilla. *Pour the hot mixture over the oats and cereal and stir until well combined. *Press well onto a parchement paper lined cookie sheet. *Now, pay seriously close attention to the next few directions..... Don't follow my example. I'm pretty sure this is where I went wrong....PACK the mixture as closely and as tightly together as humanly possible. Make it about 1/2 - 3/4 inch thick. Let it cool down, and you're ready to enjoy! Is anyone else seeing daffodils and tulips popping up, a little peek-a-boo of sunshine in the sky, and maybe the ability to leave your scarf and gloves in the closet. Folks I think Spring has hit! Actually today is officially spring. So in honor of more sunshiny days here in Portland, your fab friend Christie is posting today. Yep, I know you might have forgotten about me, but I am still here. It's been a doozy of a year, a new baby (love her), starting a new conference (a different baby), moved to a new home (projects coming soon to a blog near you) and just all around trying to figure out how to deal with this life. I don't know? We will see if I can actually get my groove back, jury is still out. Now moving on to soup, there is always room for soup. OMG! This soup is amazing. Not kidding! Do you want to know what the best part is... my husband made it! He came home one day and said, "Honey! I had this soup today at the cafe near my work and it was amazing". He asked them the ingredients and then searched online for a similar recipe, it wasn't quite right so he made it up. Whatever he did...it is soooo good! And it is pretty dang healthy minus the cream part, but it is made with all veggies, so in my book this is healthy. So, if you need a good laugh and want to see the old photos, you can see them here. But, if you want to get straight to baking these divine little things, then by all means, keep reading!! First: start off with your favorite box of chocolate cake mix. I used Duncan Hine's Devil's Food Cake because that's what I had on hand. But don't stress too much about what kind of cake mix it is. 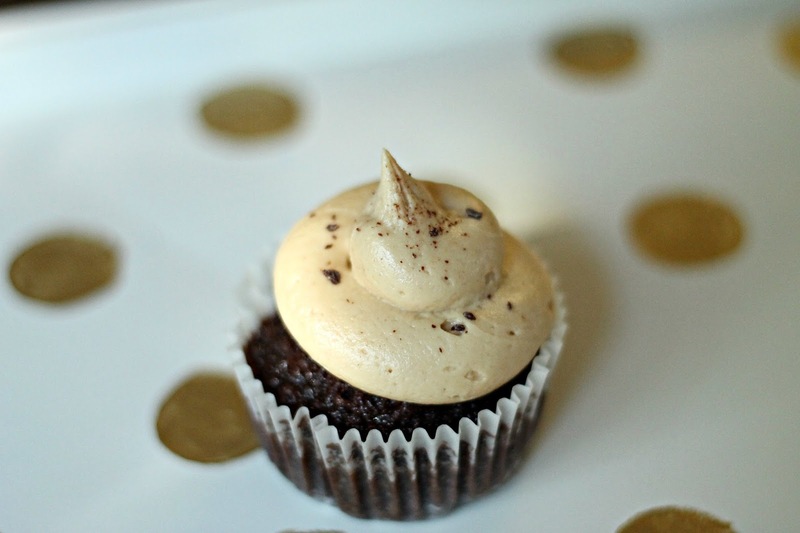 As long as it turns out somewhat chocolate-y, you are in good shape. Mix the cake mix according to package directions. Second: Pour a little batter into your cupcake liners. You don't want to fill the liners up the whole way because you don't want them to overflow once you've put the Oreo cookie in the middle. Third: place a whole Oreo on top of the batter in each cupcake liner. Yes, a whole Oreo! Yum! I used Double Stuff Oreo's because that's the only Oreo I will eat. On a little side note... One time my husband came home with a package of just regular Oreo's. I was just heartbroken. I mean, I don't eat them for the cookie part... it's all about the cream! I asked him what in the world prompted him to do such a thing, and his reasoning was you get more Oreo's in the package if they are single stuffed. Pfft. Whatever. Fourth: Top each liner off with batter until the liner is 2/3 full. Bake according to the cake mix package directions. 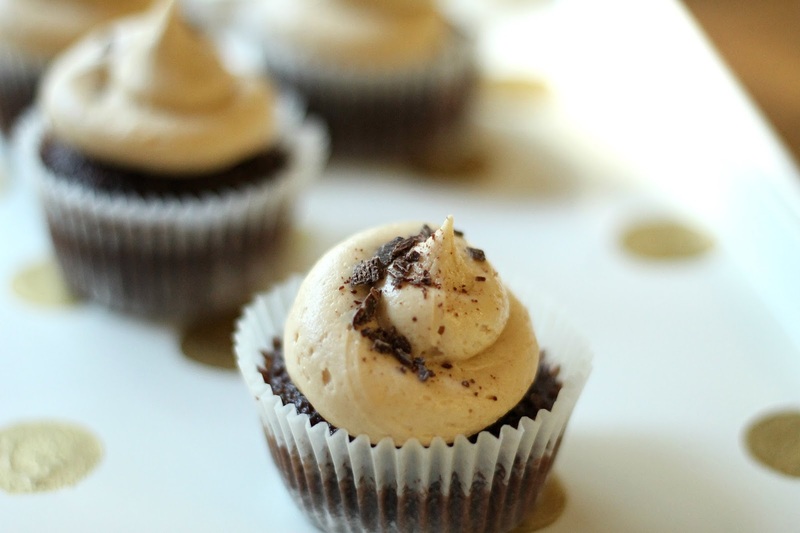 frost them with your favorite buttercream icing. I used the Vanilla Buttercream Icing recipe from Brown Eyed Baker. and placed a quarter Oreo on each cupcake. And when you are finished, you have a masterpiece of a cupcake! What a simple and fun way to present a cupcake, and you'll have everyone fooled into thinking you spent hours just making these! I had a little batter left over, so I made some mini cupcakes for my girls. I tried practicing my piping skills, and tried to pipe a little rosette onto the cupcake. It's a little harder than it looks... Ok, it's a lot harder than it looks! I think I'll just stick with the swirly things. For Christmas, my hubby bought me Photoshop Elements 11. It was 50% off, and I had been wanting it forever, so I told him to just get it and let it be my Christmas. So much for surprises, eh? Funny thing is, I have never used Photoshop.... so learned it has been a huge learning curve for me. But there is so many cool things that you can do with it! My first project was designing our header, favicon, and button. Let me tell you... I entered into a whole new world. Pixels, cropping, feathering, layering, merging the layers, etc., etc., etc. My mind was spinning the first couple of days, but I started to get the hang of it. And guess what? It's so fun!! 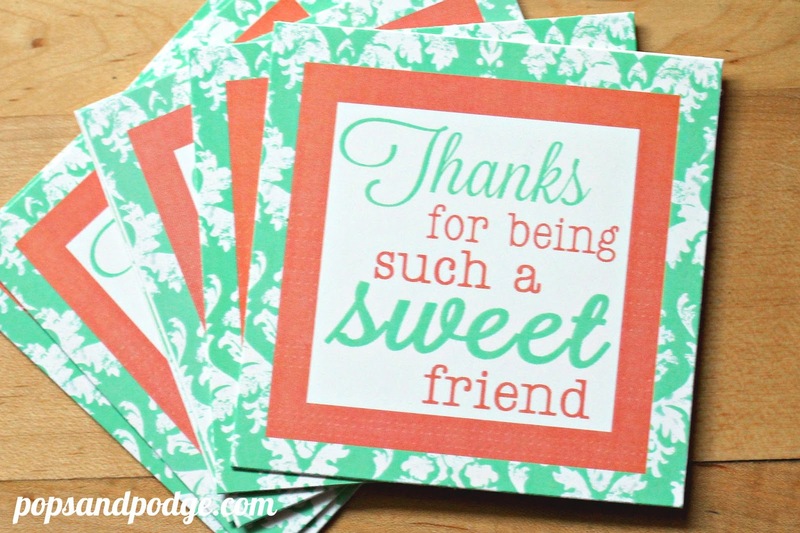 I love designing new things and finding new fonts to try out.... aaahhh! I think I'm going crazy! Valentine's is fast around the corner, and my two little girls are going to a little Valentine's Day party that me and a couple of friends put together on a whim. 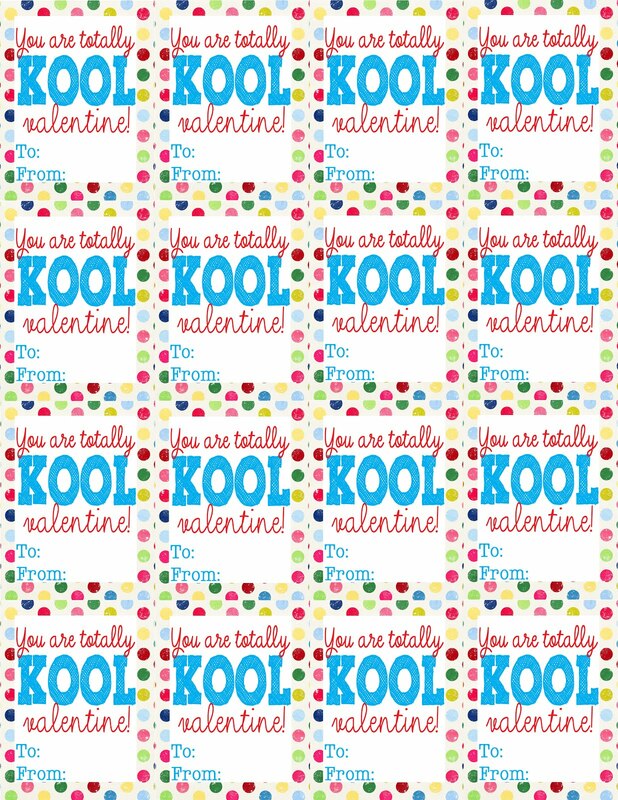 It's a pretty low-key party, so the actual valentines didn't have to be anything spectacular, but I really wanted to make my own instead of buying them. I've pinned some valentine's ideas here and I had my oldest daughter pick out what valentine she wanted to give to her friends. (My 3 yr old daughter doesn't really care.... so she gets whatever her older sister picked.) And Ava picked to give out Kool-Aid. 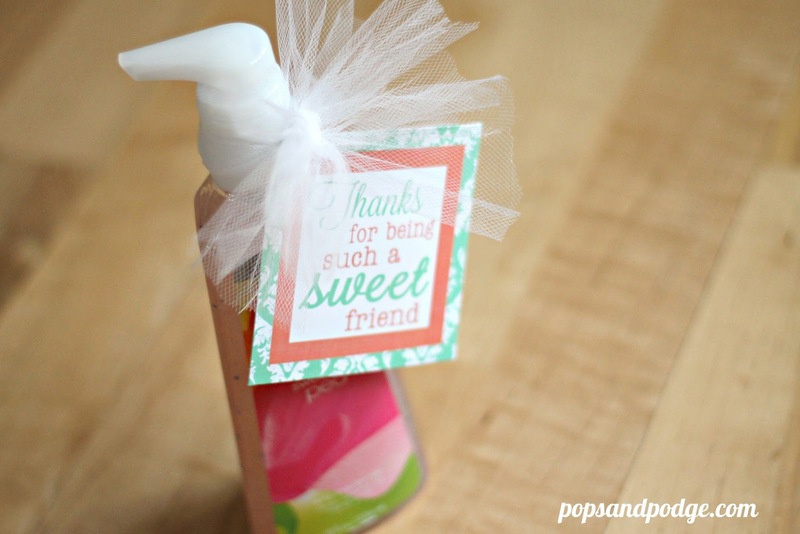 I've seen some pretty cute printables, but I really wanted to learn how to make my own. I did! 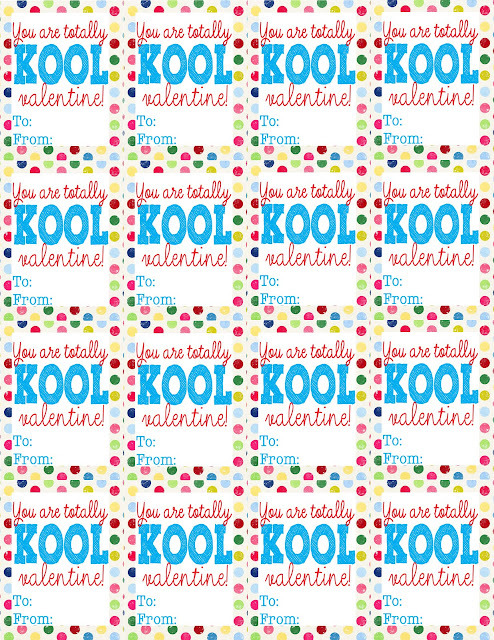 I made my very own valentine, and I am so excited that I want to share it with you!!! To download it, just click here. It's free. Can it really get better than that? Nope. Don't think so! I hope you enjoy! Little Colbie is now 10 weeks old. 10 WEEKS! I know every mother says this, but I'm going to say it too... I WANT TIME TO SLOW DOWN! I feel like time is just whizzing by, especially since she is my third child, but, at the same time, I am enjoying watching her grow. 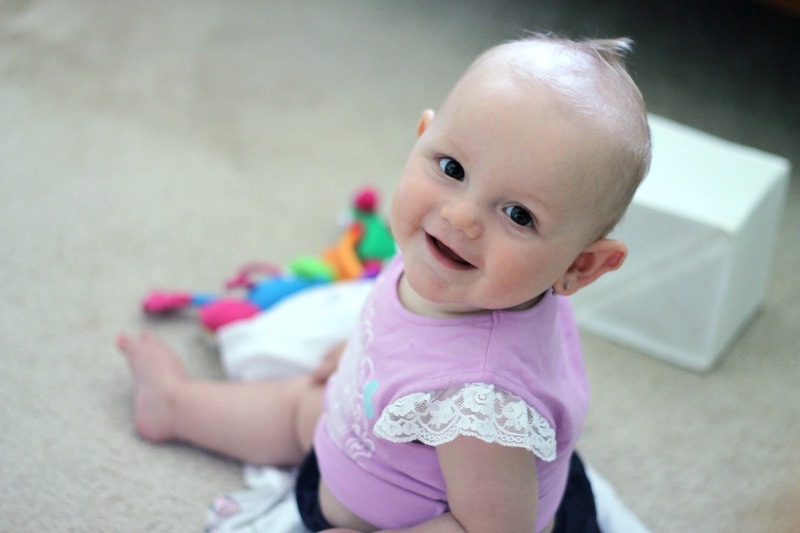 She has started to talk and interact a little, and she just couldn't be any darn cuter. Yeah, how cute is that? We live a couple of miles away from Nike World Headquarters, and while our friend was at the Nike Employee Store, he found this outfit and got it... for 1/2 off the retail price. Schaweet! Miss Colbie is growing like a weed, and I am just loving every minute with her! And I finally feel like I am getting back into somewhat of a routine since she is sleeping longer at night. Getting back into a routine, means that I am cooking and baking (and crafting) just a little bit more. Sure, there are nights when we have pb&j or just pull out a freezer meal, but I'm trying to make an effort to have a more consistent dinner routine. Some easy dinners (at least for me) are Italian dinners, which include ricotta cheese. But every time I cook an Italian dinner, I end up with extra ricotta cheese. That's where these Ricotta Cookies are a perfect solution! They use just a cup of ricotta, enough to finish off what I usually have leftover! and I also love that I don't have to waste anything! *Heat oven to 350. Coat baking sheet with nonstick cooking spray. In a bowl, whisk together flour, baking powder, baking soda, and salt. Set aside. *In another bowl, cream together butter and sugar. Add egg, ricotta, and vanilla. Continue to cream until well combined. *Slowly add in flour mixture and beat until blended. Drop by tablespoon onto the baking sheet and bake for 12-14 minutes. Let it cool on the sheet for 3 minutes, remove, and cool completely on a wire rack. Optional: Add in some lemon zest or lemon juice for a little zing. *Beat powdered sugar and milk together until well blended. If the glaze is too thick, add a tiny bit of milk. If the glaze is too runny, add in a little more powdered sugar. Drizzle onto cooled cookies and set aside until the glaze has hardened.